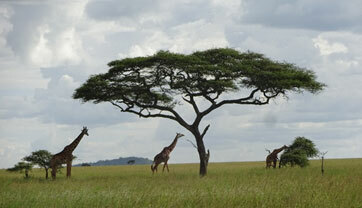 Nothing can quite match the draw of the mysterious continent of Africa or the adventure of a wildlife safari in the bush. This was certainly true for this software company’s incentive. They had taken their top sellers to Nevis, Thailand and Morocco for previous TopSail incentives. Understandably, the cachet of Africa and Tanzania was unmatched. y. In Africa, we have a hand-in-hand partnership with the best destination management company and demand nothing short of excellence. MFactor professionals have a reputation for being picky and demanding in the best way and this is especially critical when we are working in a destination that can almost guarantee unexpected challenges! Strategic preplanning focused on not only the typical nuts and bolts of a program but also addressed some of the unusual scenarios we felt were possibilities. Our team brainstormed potential “what if’s” well before program operation and developed solutions to have ready if any of these situations arose. In addition, onsite flight schedule changes presented unexpected potential delays which required our prompt resolution. During preplanning on airline schedules and flights we inquired about staffing for the flights. We learned that the small planes that flew from Arusha International Airport to the smaller landing fields in the bush routinely had one pilot; no co-pilot! This was not acceptable so we requested and were guaranteed a co-pilot on every flight for what we felt was a #1 priority precaution! Onsite, last minute departure flight changes and rescheduling combined with a lack of communication from the airlines was a major cause of concern. 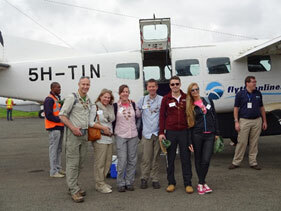 We were aware that spur of the moment schedules were frequent with these smaller flights into and out of the bush. In order to ward off this potential problem, we requested that our DMC partner confirm flight schedules multiple times…two days prior to departure, one day prior and the day of travel. Despite our detailed confirmation protocol, a situation arose where a traveler’s flight was changed just two hours prior to departure. And, we only discovered this when our DMC was at the airport to confirm the itinerary. Not only was the flight changed to an earlier time but the departure airport was also changed. A flurry of action ensued: we quickly alerted the attendees they would be leaving two hours earlier, we rescheduled their ground transportation from the game lodge to the airport and had the airline hold the flight for them. In another instance, we were told a flight had been changed to a later time only to find out that morning that the flight was due to depart at the originally scheduled earlier time. Again, quick action for everyone resulted in the couple making their flight. Had they missed the flight they would not have been able to leave Tanzania until the following day and they would have missed their connecting international flight. Exotic destinations present unusual experiences and challenges. MFactor professionals have years of solid experience that allows them to put their know-how with the unexpected to work and stay one, two or even three steps ahead to deliver seamless excellence.